Trello is the project management system that gained more popularity in our ranking within the last year than any of the other 269 monitored systems. 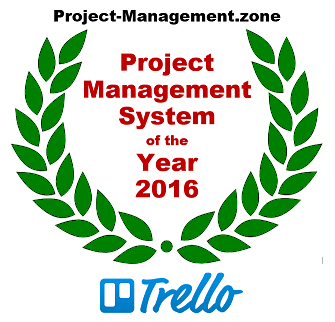 We thus declare Trello as the Project Management System of the Year 2016. For determining the project management system of the year, we subtracted the popularity scores of January 2016 from the latest scores of January 2017. We use the difference of these numbers, rather than a percentage, because that would favor systems with a tiny popularity at the beginning of the year. The result is a list of project management systems sorted by how much they managed to increase their popularity in 2016, or in other words, how many additional people started to communicate about it in one of the ways we measure in our methodology, for example job offers, professional profile entries and citations on the web. To describe Trello as a Kanban-like project management tool would not do it justice. It is based on Kanban-like boards, but Kanban is also supported by many other, mostly less popular tools. Trello doesn't even offer a strict implementation of the Kanban methodology, for example it doesn't support swimming lanes and other features. It is much better defined as a Kanban-inspired tool, that offers a superb user interface and features that are developed with the end-user in mind rather than compliance to a methodology. Project management is often seen as a bureaucratic overhead by team members. If there are systems that people might possibly describe as "a pleasure to work with", then Trello is certainly one of them. The huge rise in popularity we see in our ranking is no coincidence. JIRA is best known for its mature and full-featured bug tracking component, but it actually offers plenty of other project management features on top of that. In sharp contrast to Trello, JIRA can be used to support strict processes of a project or organization when they are needed. The fact that JIRA is doing so well in our ranking shows that there is room for a large variety of project management tools, as every project has different requirements. JIRA certainly is a good choice for a large range of projects. Slack has almost become a de-facto standard for project communication and collaboration. What may look like just-another-messenger at first glance becomes a very useful project management tool due to its business-oriented features and, perhaps even more important, due to its integration into many other tools that are typically used in projects. It often replaces email as project communication platform as it seems just as powerful and much less annoying. A new "Slack killer" tool is announced every now and then, but so far they had little impact on Slack's popularity. We congratulate Trello, Atlassian and Slack for their success in 2016. The project management system space is very crowded and it is an enormous achievement to gain popularity at this rate. It is exciting to see the variety of tools succeeding in the market. We are looking forward to monitoring the project management systems trends in 2017.